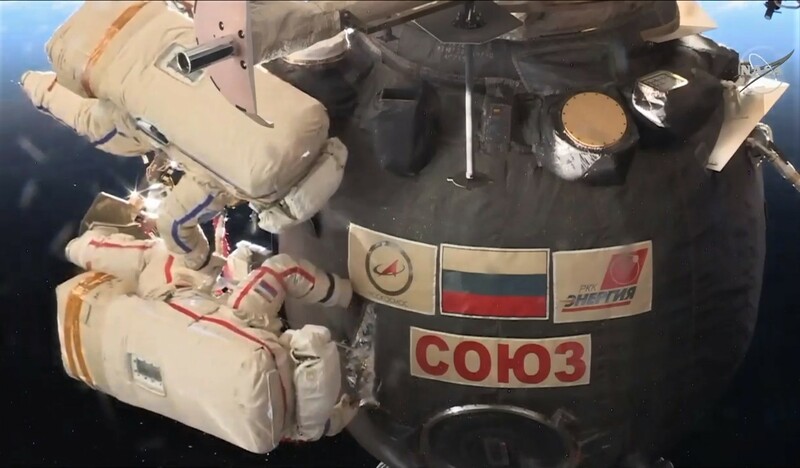 During an extraordinary spacewalk, two Russian cosmonauts used sharp objects today to cut away layers of protective insulation on a Soyuz capsule and take samples of sealant plugging up a mysterious drill hole. The hole, measuring just a tenth of an inch wide, was the source of an alarming air leak detected on the International Space Station in August. Soon after discovering the breach, the station’s crew managed to plug the hole in the Soyuz’s habitation module with epoxy and gauze, and the Soyuz has since been judged safe for next week’s return trip to Earth. Three returning spacefliers will take their seats in a separate area of the Soyuz spacecraft, the descent module, and the habitation module will be jettisoned as usual before atmospheric re-entry. Russian mission planners scheduled today’s spacewalk to gather evidence from the Soyuz’s exterior, in order to track down the cause of the breach and to determine the best way to make such repairs in the future.